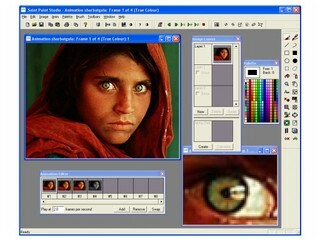 Saint Paint is the ideal paint package for creating and editing True Colour, 256 colour, 16 colour, and Monochrome graphics, and animating in any mode or combination of modes, with AVI editing support. It features all the essential graphic tools you'll need in everyday use, in a neat and very easy to use manner. Whether you are a newbie or a professional, you'll be amazed how you managed without it. Supporting GIF and JPG formats (and many more besides), it is the perfect package for designing web graphics. It is also fantastic for photo editing, with many tools including a tool for eliminating red-eye, image sharpening, and full support for printing out images. Its versatility makes it the essential graphics tool, whatever your needs are. Even if you already have a much more expensive paint package you'll find Saint Paint Studio to be invaluable. Developed for use in the games industry by artists and programmers, it has all you need for everyday use, and will establish itself as your only essential paint package. - BMP, JPG/JPEG, GIF, ICO, CUR, AVI, PNG, PCX, TIF/TIFF, TGA, WBMP and SPS (Saint Paint Studio's own format which stores animation, layers and alpha channels). - Images in Saint Paint are device independent (DIBs). When you edit your image, all the information about the palette, and the colours used will be saved internally and retained. Other paint software utilities are well known to alter palettes and images internally especially when saving, which can lead to no end of headaches. - Full support for every combination of colour depth conversion between True Colour/256 colour/16 colour/Monochrome colour images, including 2 dithering options. - Complete animation system, with GIF and basic AVI support, including mixed colour depth images and mixed image sizes. Also with a full set of animation playback controls. - A fully featured layer and alpha channel editor. - An image file browser with adjustable viewing grid and an integrated set of file handling functions - find, rename, copy, delete, undo. - Square or free hand brush grabs (selecting part of an image to use as a brush to paint with) and a comprehensive set of tools for manipulating them, including rotation (through any angle), resizing (with a bi-linear interpolation option), flipping, colour palette swapping, loading and saving, pasting as a newly created image, pasting with anti-aliasing. Also you can deform the brush image into almost any shape you like. This can be used to create a variety of interesting effects including perspective. - Single image or animated brush grabs with a variety of pasting options. - Image processing tools including conversion to negative image, conversion to black & white, brightness (including automatic brightness correction), hue control (colour tinting), contrast, gamma correction, image sharpening, image de-speckling, image blurring/softening/smoothing, image simplification (oil painting effect), a red-eye filter for eliminating red-eye from photographs, image resizing/cropping/stretching/shrinking functions (with the option of bi-linear interpolation) and image flipping. - Effects include smoothing/blurring, translucency and brush paste fades. - Quick Image duplication. Image copying and pasting via the Windows Clipboard, therefore incorporating screen capture functionality. - A full range of painting tools including lines, simple geometry, spray can, text, curves, square and freehand brushes. - A 256 colour palette remapping and swapping utility, including batch processing. Also batch processing into different file formats etc can be acheived by using the animation system as a simple image buffer. - A host of palette manipulation tools, including loading and saving palettes, colour spreads, swapping, copying and excluding (a palettised image can be forced into any set of selected colours). - A symmetry tool that allows easy production of cyclic or tiled patterns (very useful for website wallpaper). Full support for printing.